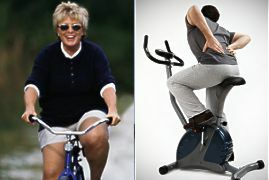 any modern rail or post type bike seat to your exercise bike! If you are ordering a seat too, order the adaptor when you order the seat. Our universal design allows our saddles to be mounted to any bicycle without a special adaptor! Mounting instructions are included. *Typical price - your price may vary. You will be contacted for approval. Note the bike model in order form! Round Post Seat Clamp Only 7/8"
Purchase with seat and SAVE. or call us and we will custom make an adaptor to fit your bike.